Louise Gwendolen Cullen also went by the nick-name of Lulu. [S1221] Michael (deceased) Ashworth, "re: Palmer Family," e-mail to Darryl Lundy, 18 December 2004 - 3 November 2005. [S19] Adam and Charles Black Ltd, Who's Who 1975: An Annual Autobiographical Dictionary (London, U.K.: Adam and Charles Black, 1975), page 5. Hereinafter cited as Who's Who 1975. 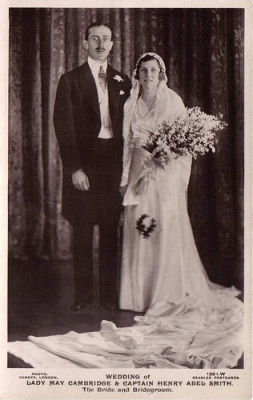 From 14 December 1957, her married name became Liddell-Grainger. [S3] Marlene A. Eilers, Queen Victoria's Descendants, page 216. [S12] C. Arnold McNaughton, The Book of Kings: A Royal Genealogy, in 3 volumes (London, U.K.: Garnstone Press, 1973), volume 2, page 529. Hereinafter cited as The Book of Kings. From 31 October 1985, her married name became Liddell-Grainger.